DESPITE nearly 2,000 validated incidents of people being forced from their homes in Northern Ireland due to intimidation in the past five years, just 32 convictions for housing intimidation have been secured during a similar time period. Leading victims and justice groups are calling on the Police Service of Northern Ireland (PSNI) to provide greater transparency on how it is addressing the problem, which has cost the Housing Executive more than £7.5million since 2012. Information on where the majority of incidents have taken place suggests the involvement of loyalist paramilitaries. Despite the huge number of incidents and the multi-million pound financial cost, the PSNI has said it does not record housing intimidation in its own right, rather including it in an overarching category encompassing all forms of intimidation offences. During the financial years 2012/13 to 2016/17 the Housing Executive spent £6,709,430 buying 57 houses from homeowners forced out of their property as a result of paramilitary, sectarian, racist, sexual orientation and disability related intimidation. The Housing Executive also paid out £808,174 in Emergency Grant Payments of £754 to over 1,000 householders who had to move from their rented homes due to intimidation during this five-year period. During the period, a total of 2,060 incidents of housing intimidation were accepted by the Housing Executive. A sample of data from the past two years also showed that the overwhelming majority of incidents were recorded in Belfast, Lisburn & Castlereagh, Ards & North Down and the Antrim & Newtownabbey council areas. A more detailed breakdown (eg by postcode, town, estate) is not available. Court figures reveal that just 32 convictions were secured for the offence of ‘intimidation - causing person to leave residence/occupation’ between March 2011 and August 2016. The issue of housing intimidation recently hit the headlines after four Catholic families living in the Cantrell Close area of Belfast were forced to leave their homes, with Chief Constable George Hamilton blaming the UVF. However, rather than being a one-off incident, housing intimidation is a long-term problem which since the signing of the Good Friday Agreement in 1998 has seen more than 10,000 accepted cases. Thousands of other alleged cases were reported but not verified. Housing intimidation since the Good Friday Agreement. Data provided by the Housing Executive. After 2002/03, when 1,077 incidents were accepted, the prevalence was on a downward trajectory until 2007/08 when 278 incidents were recorded. Since then, the problem began to rise again and has averaged 412 accepted cases per year across the last five years. According to Daniel Holder of the Committee on the Administration of Justice (CAJ) the long term nature of the problem and the overall lack of transparency surrounding how authorities attempt to address it are of concern. "These statistics should cause an outcry every year, but they aren't even being routinely published," he said. "I think it is a pretty shocking figure that 20 years into a post conflict transition we are still dealing with violent housing intimidation at such high levels and it doesn’t receive the level of attention it deserves." According to Alyson Kilpatrick, the former Human Rights advisor to the Policing Board, at present the PSNI use intermediary organisations to help validate paramilitary threats. "They will verify, as far as they can, if a threat is real and if a threat is emanating from a group with which they have some contact," she said. "That doesn’t necessarily mean that there is a threat and certainly the police also have to make an assessment because it is them that sign the Chief Constable's certificate." The Chief Constable's certificate is issued in instances where a homeowner has been forced to evacuate their home due to intimidation and that he or she is deemed to be "at risk of serious injury or death". Detail Data lodged Freedom of Information requests with the PSNI relating to how many arrests had followed incidents of intimidation which required the Housing Executive to purchase the house. The PSNI refused to provide the information on 'cost grounds'. However, a Freedom of Information request to the Courts Service revealed that between March 2011 and August 2016 there had been just 32 convictions for the offence of 'Intimidation - causing person to leave residence/occupation'. Detail Data asked the PSNI a series of questions relating to how it deals with the issue of housing intimidation. The responses can be read here. Speaking to Detail Data, PSNI Chief Constable George Hamilton said £50million is being invested in new paramilitary taskforce that aims to tackle, among other things, the intimidation issue. "I think it is an example of the sort of grip that paramilitary groups or some people within paramilitary groups have in local communities and it is something that we want to disrupt and dismantle and that is what this ringfenced money is about and the taskforce will be going about trying to make as much impact upon that as possible," he said. "What this initiative is doing under the so called ‘Fresh Start’ agreement is to allow us at a time of shrinking budgets is to have additional budgets, to ensure that our focus on paramilitary groups grows. That we unashamedly make their life more difficult. That we protect communities, that we protect the vulnerable and actually that we bring offenders to justice from a law enforcement perspective. "The strength of the action plan is also that it engages the voluntary sector, the community itself by building capacity, by building confidence and other statutory agencies including the NCA (National Crime Agency) and HMRC so we can bring as many tools out of the box to make life difficult for those involved in intimidation and other paramilitary activity," he said. The Department for Communities (DfC) is currently considering the removal of the 200 housing points currently awarded to intimidation victims who are seeking social housing. With few exceptions, these points place affected individuals at the head of the housing list. Despite the proposed removal, DfC has said it does not believe victims will be placed at additional risk by potentially prolonging the period they have to wait for new housing. "The proposed change would not affect the current practice regarding urgent treatment of those experiencing intimidation," a statement read. "Where a household or person is considered to be in serious and imminent danger, they would be removed from that danger and offered alternative accommodation on an emergency basis. "They would be treated similarly to other applicants who may have experienced equally traumatic circumstances, for example the loss of their home because of fire, flood or other disaster and who are assisted, alongside all other existing applicants, through the homelessness legislation and the Selection Scheme. "The removal of intimidation points would place intimidated households at a similar level of priority to an applicant who has experienced domestic violence." Both DfC and the Housing Executive have stated that the proposed removal of intimidation points is not connected to repeated suggestions that the current system is being abused. Indeed, both organisations have said that they can find no evidence of abuse of the system. Housing intimidation in Northern Ireland. Infographic by Chris Scott. In the last five financial years (2012/13 to 2016/17) the Housing Executive accepted 2,060 reports of people being intimidated from their homes. A further 1,000 applications were rejected. The vast majority of accepted cases relate to paramilitary intimidation (1,523). Anti-social behaviour (222), sectarian (153) and racial (112) intimidation also featured highly. Housing intimidation in numbers, by year and by type. Despite being recorded in individual categories, Daniel Holder (CAJ) believes there is considerable crossover in relation to perpetrators. “Most of the attacks have been conducted by paramilitary organisations or people with paramilitary connections and a lot of those attacks will be racist or sectarian," he said. "You can draw that inference from it, but we shouldn’t have to be drawing inferences. There should be a much better assessment of the data and which organisations are responsible for the majority of housing intimidation." In response a spokesperson for the Housing Executive said: “Our data collection does not allow multiple answers. Staff are asked to select a single category for classification and do so based on their judgement as to what is most appropriate for the particular case. Also, it is a question of what the applicant expresses is the cause. 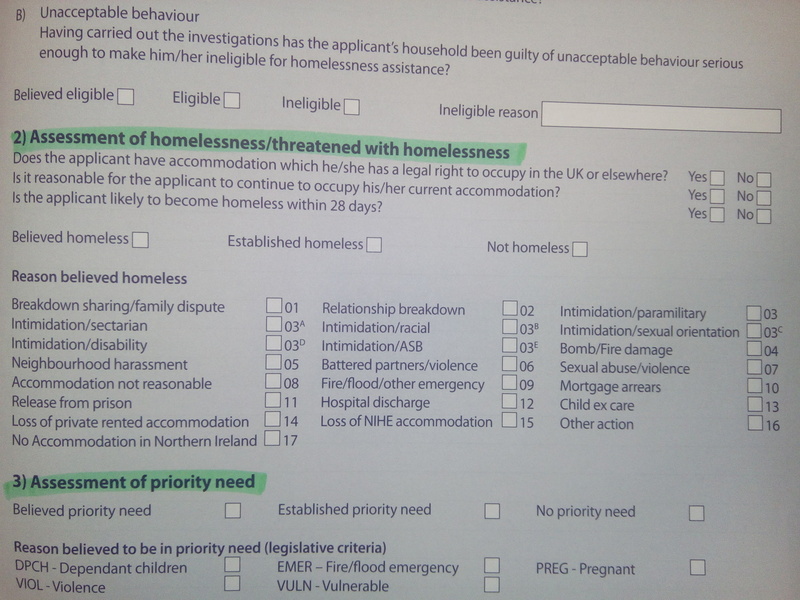 The Housing Executive's Housing/Homeless Assessment and Input Form indicates how intimidation is recorded. As part of Detail Data's 2016 investigation into ongoing paramilitary activity, Alan McBride of Belfast's Wave Trauma Centre said half of the charity's current referrals were the result of intimidation. “At least 50% of our referrals today are in relation to ongoing intimidation,” he said. A year on, Mr McBride said he believed the PSNI needed to do more to eradicate the problem. "There can be no room in today’s society for self-appointed vigilantes administering summary justice. The only organisation that should address this is the PSNI," he said. "No matter how you look at this the answer lies with the PSNI." Anonymised account of housing intimidation provided by Hurt NI. The scale and cost of intimidation varies across housing sectors. Between 2012/13 and 2016/17 at least 1,071 rental households from the private sector and from social housing were in receipt of Emergency Grant Payments totalling £808,174. Data also indicates that SPED (Scheme for the Purchase of Evacuated Dwellings) purchases of private homes is on a significant downward trajectory – from 60 between 2011/12 and 2013/14 to 16 between 2014/15 and 2016/17. Despite this, the cost of SPED remains substantial. SPED figures 2011/12 to 2016/17. Between 2011/12 and 2016/17 a total of £9,888,880 was spent purchasing 76 homes under SPED. A Ministerial response to a March 2016 Assembly question to then Finance Minister Máirtín Ó Muilleoir confirmed that between January 2012 and May 2016 13 homeowners eligible for SPED did not avail of it. Although the reason for refusal is not known, it is believed low prices offered are partially responsible in some cases with a recent court ruling stating that valuations should not factor in adverse security considerations - such as proximity to an interface. Despite this, revenue figures from SPED property disposal reveal average sale price to considerably lower than average purchase price. This figure could be influenced by rapidly falling house prices between 2008 and 2013. Detail Data used Freedom of Information legislation to ask the PSNI for the number of arrests and charges which followed each SPED investigation in the last five years. The PSNI refused the request on the grounds of how much it would cost to provide the information. However, Detail Data was able to secure information relating to the number of convictions secured which related to ‘intimidation - causing person to leave residence/occupation’ from the Northern Ireland Courts and Tribunals Service (NICTS). This data reveals that between January 2011 and August 2016 there were just 32 convictions. In its response the PSNI said it could not give geographical data because: "The SPED scheme is owned and administered by the Northern Ireland Housing Executive and they own information relating to this scheme." Of the council area data provided, analysis of the past two financial years of data (2015/16-2016/17) highlights that the vast majority of recorded incidents took place in Belfast; Lisburn & Castlereagh; Ards & North Down and Antrim & Newtownabbey. Forced from home by cause and council area 2015/16 to 2016/17. Queen's University Research Fellow Dr Neil Jarman previously found that the bulk of cases of reported incidents of intimidation (2010-11) occurred in areas with a strong loyalist paramilitary presence. Dr Jarman believes a greater level of data should be available that would allow statutory authorities, the third sector and the general public to ascertain which organisations are responsible. "I think the key is that the failure to identify where the intimidation is taking place makes it impossible to develop a coherent strategy to challenge intimidation," he said. "You simply can’t do this if you are being told there are so many incidents in say Ards and North Down council area – you actually want to know what estates they are happening in. "The problem is we move the victim out of an area and we rehouse the victim whilst the perpetrator is left to carry on and if there is someone else in that area they decide to take issue with then there could be further cases of intimidation. "I think you would have to ask why agencies such as the PSNI and Executive are not releasing data on this. The PSNI pull together data on paramilitary style assaults, they pull together data on hate crimes, it shouldn’t be difficult to pull together data on (housing) intimidation." In June 2017, PSNI Assistant Chief Constable Drew Harris told BBC Radio Ulster that around 20 police officers had being intimidated from their homes each year over the last five years. Detail Data asked the PSNI, under Freedom of Information, for details on each incident where a police officer had had to move home as a result of intimidation over the last five years. The request was refused by the PSNI on cost grounds. The author of the report and former Policing Board human rights advisor, Alyson Kilpatrick told Detail Data: "The recommendation I made was that the PSNI and the Housing Executive would really sit down, put their heads together, and compare their own figures. "Each of them must have some information. Look at the areas where this is happening, look at the triggers, when it has happened and if it is real what are they doing about it." At the launch of the publication on June 28, Detail Data asked PSNI Superintendent Emma Bond about the police’s response to incidents where items such as flags and graffiti had been placed at homes. In her response Superintendent Bond said: “We would always work with partners, be it through the Housing Executive or local councils or others, to attempt to get anything, whether it is posted on a wall or that is causing offence, to have it removed. At the launch event, Ms Kilpatrick questioned the response, saying: “If items like that are left for hours or days then the person who thinks they are the target of it are not going to have any degree of confidence if it stays there and the police are walking past it,” she said. Video footage recorded by the Policing Board at the launch event can be viewed here. Katie Johnson of Victim Support said that many victims do not feel the police will deal with their complaints. “We have had victims tell us a vast amount of reasons as to why they don’t want to go to the police,” she said. “It could be that they have had a previous negative experience with the police or the criminal justice system. We have to consider language barriers and whilst the police will have access to interpreters the victim may not know that and the victim may not feel comfortable going in to the police station in the first instance. “We consider disability issues. We also have to consider religious reasons and political reasons. “The hate crime advocacy service within Victim Support was set up to attempt to eliminate or attempt to eliminate the barriers for victims." For more information on SPED and emergency grants click here. The data from this feature is available to explore here. 8,158 deaths in Northern Ireland: "We need a suicide prevention strategy as a matter of urgency"